The new version of www.le-vpn.com website is online! The whole team of Le VPN is pleased to present you the new Le VPN website. It is now more interactive, with lots of content and videos offering complete information on how to secure your Internet connection, wherever you are in the world. The big news comes from our fun customer testimonials section in both video and text that will show you what our customers think of our services. In the Features section, you will find all the tips to unblock censorship. You will also find a way to make your P2P activities safely. You will also understand how a VPN service allows you to surf anonymously and securely. You will also have the list of the 20 countries where the VPN allows you to locate and hide your IP address. You will also find a way to protect your connection, regardless of the location of your connection, even using WIFI unsecure connection. Finally, you can, among others, find the famous AES encryption technology system used by Le VPN. VPN Servers in the section, you can directly access the VPN server that corresponds to your location, e.g. if you are based for example in Japan or in the UK, for a secure and fast Internet access. 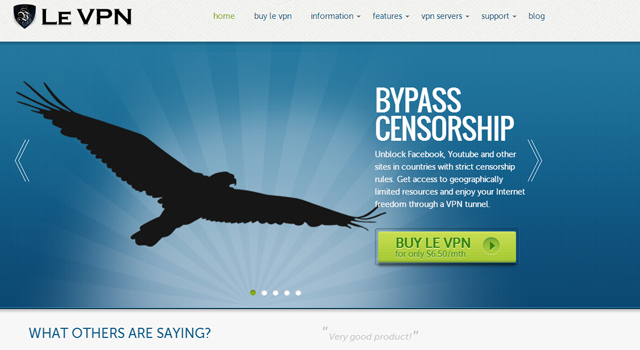 The site also now includes Le VPN Blog with all the news about internet security in the world. So stay tuned! Finally, in the support section, you will of course the first steps on how to start with Le VPN, refer to the Knowledge database or request the assistance of our technical team. Enjoy your visit of our new website!